Download "ROSEMARY A. LESTER, M.A., CCC-SLP"
4 Gathered and analyzed behavioral and acoustic data; performed data analyses using Praat speech analysis software and Igor Pro data analysis software TEACHING EXPERIENCE Adjunct Instructor Lester, R.A. (Spring 2014). SPH 557: Dysphagia, UA, Tucson, AZ. Preceptor Lester, R.A. (Spring 2012). SPH 261: Anatomy and Physiology of the Speech Mechanism, UA, Tucson, AZ. Independently taught two laboratory sections each week to support students understanding of information covered in course lectures given by Dr. Story Lester, R.A. (Fall 2011). 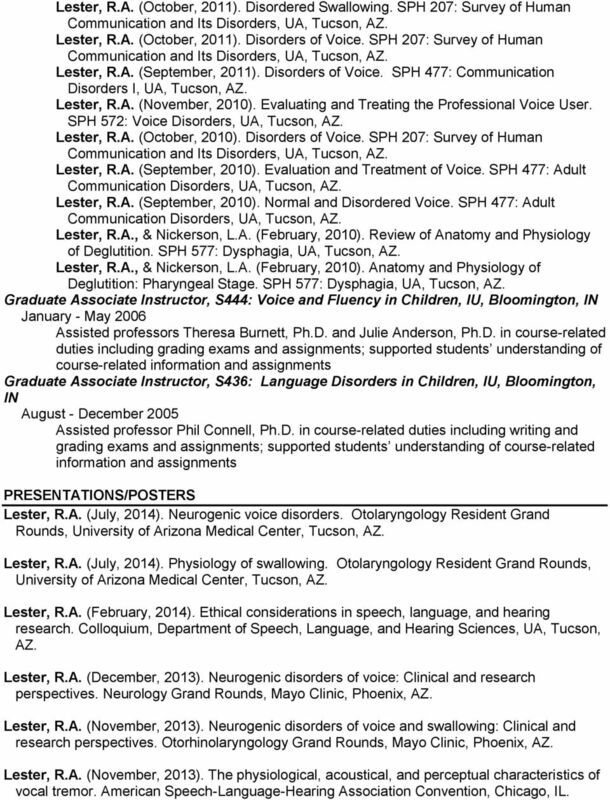 SPH 572: Voice Disorders, UA, Tucson, AZ. Presented six lectures on laryngeal anatomy, neural control of phonation, respiration for phonation, vocal tract resonance, and neurological voice disorders with the guidance and feedback of Dr. Story Guest Lecturer Lester, R.A. (April, 2014). Research Misconduct. SLHS 649: Survival Skills and Ethics, UA, Tucson, AZ. Lester, R.A. (April, 2014). Improving vocal health in singers with voice therapy. Music 510: Pedagogy, UA, Tucson, AZ. Lester, R.A. (March, 2014). Grants and Grantspersonship Panel. SLHS 649: Survival Skills and Ethics, UA, Tucson, AZ. Lester, R.A. (February, 2014). Ethical considerations in speech, language, and hearing research. 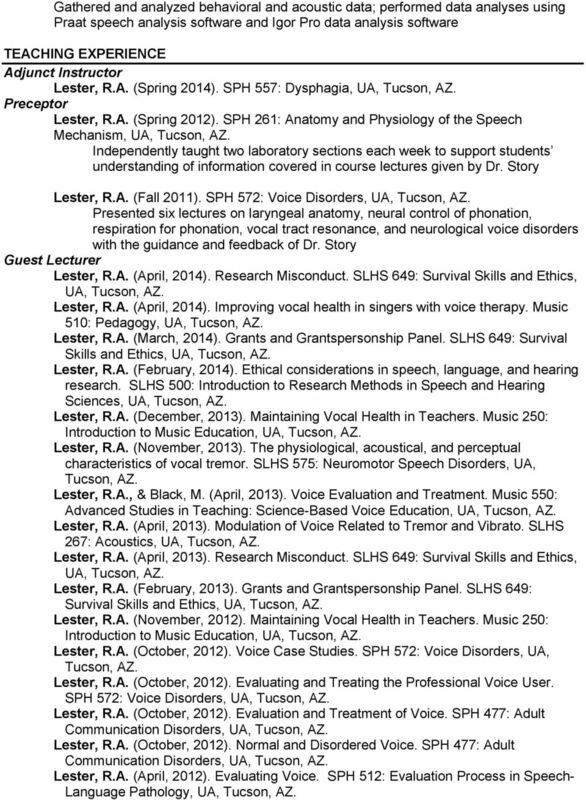 SLHS 500: Introduction to Research Methods in Speech and Hearing Sciences, UA, Tucson, AZ. Lester, R.A. (December, 2013). Maintaining Vocal Health in Teachers. Music 250: Introduction to Music Education, UA, Tucson, AZ. Lester, R.A. (November, 2013). The physiological, acoustical, and perceptual characteristics of vocal tremor. 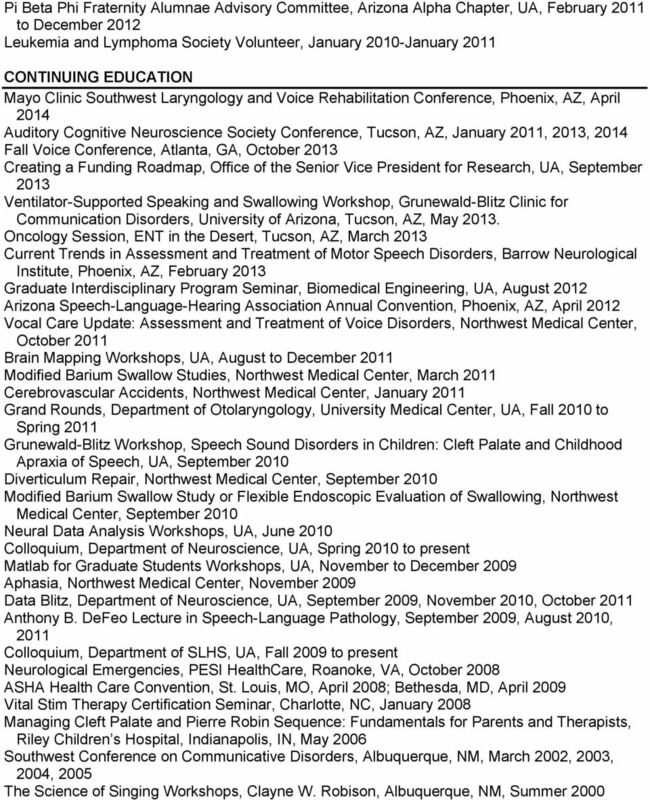 SLHS 575: Neuromotor Speech Disorders, UA, Tucson, AZ. Lester, R.A., & Black, M. (April, 2013). Voice Evaluation and Treatment. Music 550: Advanced Studies in Teaching: Science-Based Voice Education, UA, Tucson, AZ. Lester, R.A. (April, 2013). Modulation of Voice Related to Tremor and Vibrato. SLHS 267: Acoustics, UA, Tucson, AZ. Lester, R.A. (April, 2013). Research Misconduct. SLHS 649: Survival Skills and Ethics, UA, Tucson, AZ. Lester, R.A. (February, 2013). Grants and Grantspersonship Panel. SLHS 649: Survival Skills and Ethics, UA, Tucson, AZ. Lester, R.A. (November, 2012). Maintaining Vocal Health in Teachers. Music 250: Introduction to Music Education, UA, Tucson, AZ. Lester, R.A. (October, 2012). Voice Case Studies. 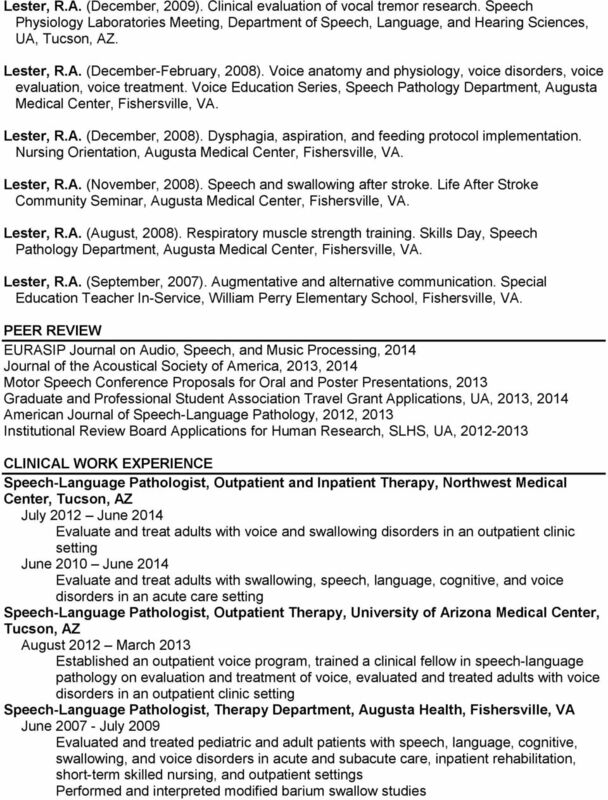 SPH 572: Voice Disorders, UA, Tucson, AZ. Lester, R.A. (October, 2012). Evaluating and Treating the Professional Voice User. 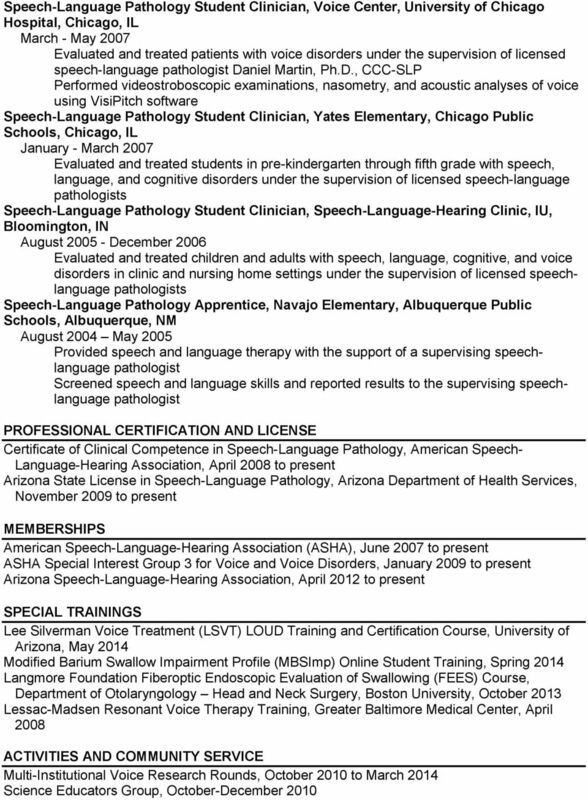 SPH 572: Voice Disorders, UA, Tucson, AZ. Lester, R.A. (October, 2012). Evaluation and Treatment of Voice. SPH 477: Adult Communication Disorders, UA, Tucson, AZ. Lester, R.A. (October, 2012). Normal and Disordered Voice. SPH 477: Adult Communication Disorders, UA, Tucson, AZ. Lester, R.A. (April, 2012). Evaluating Voice. SPH 512: Evaluation Process in Speech- Language Pathology, UA, Tucson, AZ. 5 Lester, R.A. (October, 2011). Disordered Swallowing. SPH 207: Survey of Human Communication and Its Disorders, UA, Tucson, AZ. Lester, R.A. (October, 2011). Disorders of Voice. SPH 207: Survey of Human Communication and Its Disorders, UA, Tucson, AZ. Lester, R.A. (September, 2011). Disorders of Voice. SPH 477: Communication Disorders I, UA, Tucson, AZ. Lester, R.A. (November, 2010). Evaluating and Treating the Professional Voice User. 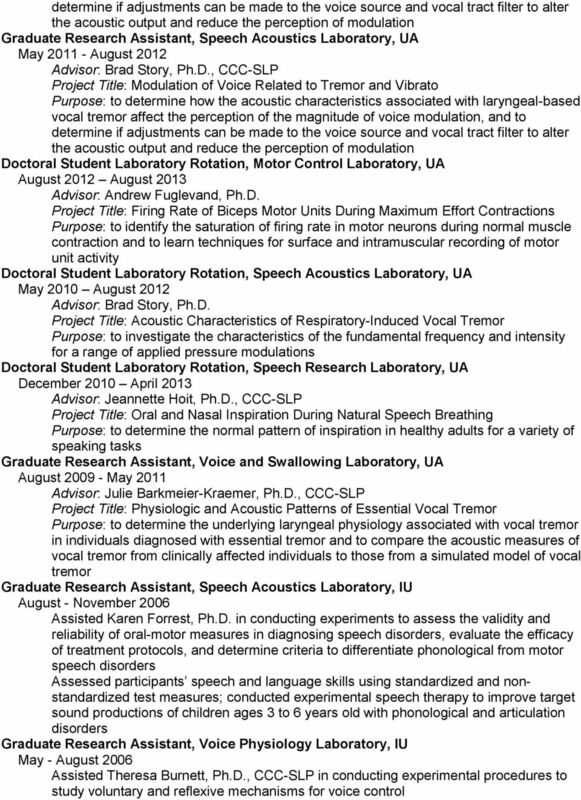 SPH 572: Voice Disorders, UA, Tucson, AZ. Lester, R.A. (October, 2010). Disorders of Voice. SPH 207: Survey of Human Communication and Its Disorders, UA, Tucson, AZ. Lester, R.A. (September, 2010). Evaluation and Treatment of Voice. SPH 477: Adult Communication Disorders, UA, Tucson, AZ. Lester, R.A. (September, 2010). Normal and Disordered Voice. SPH 477: Adult Communication Disorders, UA, Tucson, AZ. Lester, R.A., & Nickerson, L.A. (February, 2010). Review of Anatomy and Physiology of Deglutition. SPH 577: Dysphagia, UA, Tucson, AZ. Lester, R.A., & Nickerson, L.A. (February, 2010). Anatomy and Physiology of Deglutition: Pharyngeal Stage. SPH 577: Dysphagia, UA, Tucson, AZ. Graduate Associate Instructor, S444: Voice and Fluency in Children, IU, Bloomington, IN January - May 2006 Assisted professors Theresa Burnett, Ph.D. and Julie Anderson, Ph.D. in course-related duties including grading exams and assignments; supported students understanding of course-related information and assignments Graduate Associate Instructor, S436: Language Disorders in Children, IU, Bloomington, IN August - December 2005 Assisted professor Phil Connell, Ph.D. in course-related duties including writing and grading exams and assignments; supported students understanding of course-related information and assignments PRESENTATIONS/POSTERS Lester, R.A. (July, 2014). Neurogenic voice disorders. Otolaryngology Resident Grand Rounds, University of Arizona Medical Center, Tucson, AZ. Lester, R.A. (July, 2014). Physiology of swallowing. Otolaryngology Resident Grand Rounds, University of Arizona Medical Center, Tucson, AZ. Lester, R.A. (February, 2014). Ethical considerations in speech, language, and hearing research. Colloquium, Department of Speech, Language, and Hearing Sciences, UA, Tucson, AZ. Lester, R.A. (December, 2013). 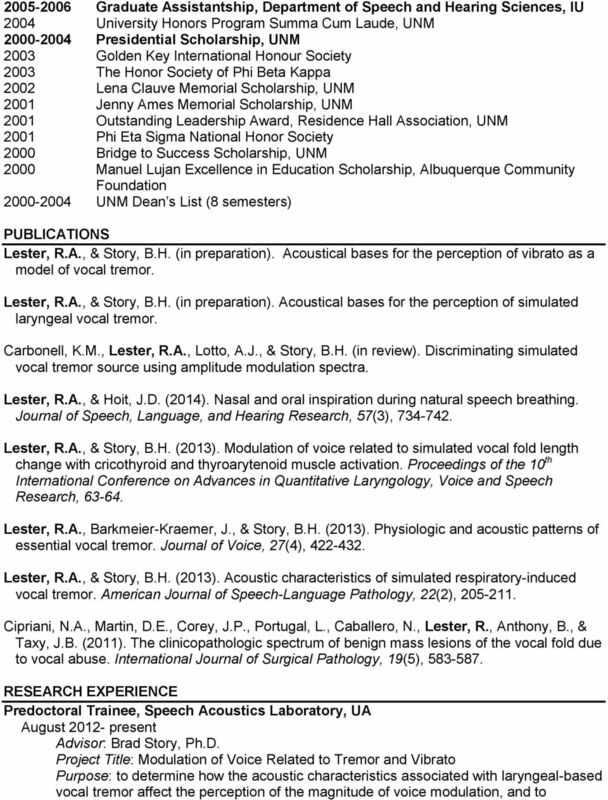 Neurogenic disorders of voice: Clinical and research perspectives. Neurology Grand Rounds, Mayo Clinic, Phoenix, AZ. Lester, R.A. (November, 2013). Neurogenic disorders of voice and swallowing: Clinical and research perspectives. Otorhinolaryngology Grand Rounds, Mayo Clinic, Phoenix, AZ. Lester, R.A. (November, 2013). The physiological, acoustical, and perceptual characteristics of vocal tremor. American Speech-Language-Hearing Association Convention, Chicago, IL. 6 Lester, R.A., Story, B.H. (June, 2013). Modulation of voice related to simulated vocal fold length change with cricothyroid and thyroarytenoid muscle activation. Poster presented at the Advances in Quantitative Laryngology, Voice and Speech Research, Cincinnati, OH. Lester, R.A., Story, B.H. (June, 2013). Modulation of voice related to tremor and vibrato. Poster presented at the Voice Foundation Symposium, Philadelphia, PA. Black, M., & Lester, R.A. (March, 2013). 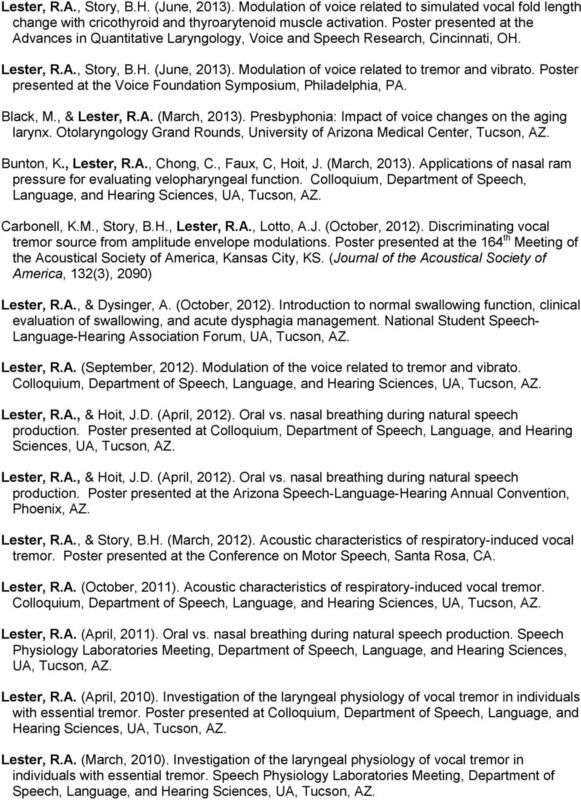 Presbyphonia: Impact of voice changes on the aging larynx. Otolaryngology Grand Rounds, University of Arizona Medical Center, Tucson, AZ. Bunton, K., Lester, R.A., Chong, C., Faux, C, Hoit, J. (March, 2013). Applications of nasal ram pressure for evaluating velopharyngeal function. Colloquium, Department of Speech, Language, and Hearing Sciences, UA, Tucson, AZ. Carbonell, K.M., Story, B.H., Lester, R.A., Lotto, A.J. (October, 2012). Discriminating vocal tremor source from amplitude envelope modulations. Poster presented at the 164 th Meeting of the Acoustical Society of America, Kansas City, KS. (Journal of the Acoustical Society of America, 132(3), 2090) Lester, R.A., & Dysinger, A. (October, 2012). Introduction to normal swallowing function, clinical evaluation of swallowing, and acute dysphagia management. National Student Speech- Language-Hearing Association Forum, UA, Tucson, AZ. Lester, R.A. (September, 2012). Modulation of the voice related to tremor and vibrato. Colloquium, Department of Speech, Language, and Hearing Sciences, UA, Tucson, AZ. Lester, R.A., & Hoit, J.D. (April, 2012). Oral vs. nasal breathing during natural speech production. Poster presented at Colloquium, Department of Speech, Language, and Hearing Sciences, UA, Tucson, AZ. Lester, R.A., & Hoit, J.D. (April, 2012). Oral vs. nasal breathing during natural speech production. Poster presented at the Arizona Speech-Language-Hearing Annual Convention, Phoenix, AZ. Lester, R.A., & Story, B.H. (March, 2012). Acoustic characteristics of respiratory-induced vocal tremor. Poster presented at the Conference on Motor Speech, Santa Rosa, CA. Lester, R.A. (October, 2011). Acoustic characteristics of respiratory-induced vocal tremor. Colloquium, Department of Speech, Language, and Hearing Sciences, UA, Tucson, AZ. Lester, R.A. (April, 2011). Oral vs. nasal breathing during natural speech production. Speech Physiology Laboratories Meeting, Department of Speech, Language, and Hearing Sciences, UA, Tucson, AZ. Lester, R.A. (April, 2010). Investigation of the laryngeal physiology of vocal tremor in individuals with essential tremor. Poster presented at Colloquium, Department of Speech, Language, and Hearing Sciences, UA, Tucson, AZ. Lester, R.A. (March, 2010). Investigation of the laryngeal physiology of vocal tremor in individuals with essential tremor. Speech Physiology Laboratories Meeting, Department of Speech, Language, and Hearing Sciences, UA, Tucson, AZ. FACULTY OF HEALTH PROFESSIONS School of Human Communication Disorders Speech-Language Pathology Curriculum Foundation Course Linkages Phonetics (HUCD 5020) a. Vowels b. Consonants c. Suprasegmentals d.
MASTER OF SCIENCE in SPEECH, LANGUAGE, AND HEARING SCIENCES 2014-15 Student Handbook The Cactus Book Department of Speech, Language, and Hearing Sciences The University of Arizona 111 E. 2 nd Street P.O. 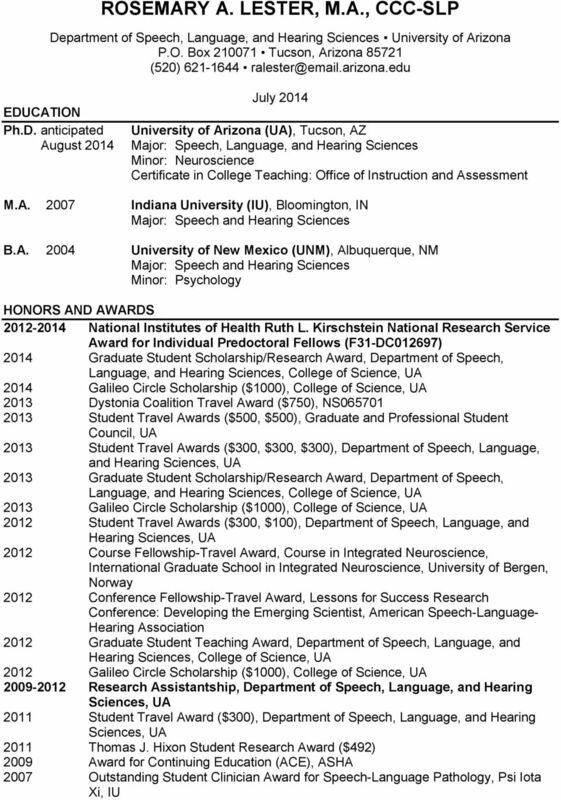 MASTER OF SCIENCE in SPEECH, LANGUAGE, AND HEARING SCIENCES 201-14 Student Handbook The Cactus Book Department of Speech, Language, and Hearing Sciences The University of Arizona 111 E. 2 nd Street P.O. Jonathan G. Tullis. Professional Positions Assistant Professor, University of Arizona Department of Educational Psychology.